TYPE: Exo-luxury resort and spa. ROOMS: Twenty individual elevated bungalows (with king or two double beds, and a trundle for a child) set in the middle of the forest. Seamlessly blends into the environment, with a deck, sitting area, and two hammocks. Despite rugged design, rooms are have air conditioning and cable TV. POOL/GYM: Three natural spring-fed pools of varying temperature, one with a swim-up pool bar. RESTAURANT: The onsite restaurant specializes in sustainable, local farm to table offerings. Fresh fish, seafood, and local meat dishes are offered daily. The restaurant, bar, and lounge have a natural wood decor and a semi-open air orientation, designed to maximize airflow without the need for air conditioning. Though it was 80° during our visit, the restaurant design succeeded in keeping things cool. BAR: Two bar and lounge areas. Swim-up bar located in the mineral pool area, and indoor bar attached to the lobby and restaurant. Bartenders are more like mixologists, creating new cocktails with local fresh fruit based on personal preference. VIBE: Chic and minimalist, yet warm and romantic. SPA: Wonderful spa facility with several large treatment rooms, as well as couples rooms overlooking the pools and canyon. All forms of massage and treatments available. WIFI: Available throughout, and complimentary for SmartFlyer clients. KIDS: Yes, definitely bring them. Unlike other Costa Rican locations, Rio Perdido is self contained. Zip lines, hiking tours, white water tubing, mountain biking, and natural springs are all on site. However, bungalows are only designed to sleep two adults and a child. Larger families will need two side-by-side bungalows, though plans are underway to build larger family units. LOCATION: San Bernardo de Bagaces, Guanacaste, Costa Rica, about twenty-five kilometers south of Liberia and Daniel Oduber Quirós (LIR) International Airport. This is an off the beaten path treasure. 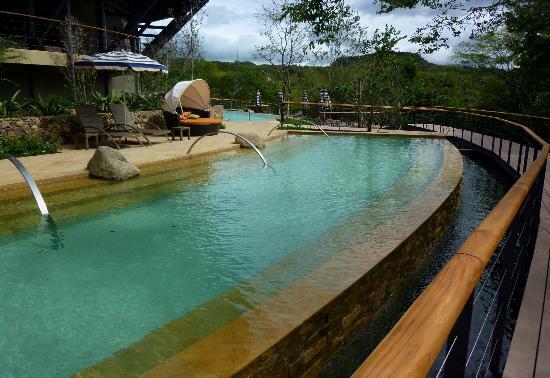 The resort is nestled in 500 acres of canyons and forests within Guanacaste. The owner discovered the natural springs and beauty of the canyons and spared no expense at creating an eco-retreat here, one that is a model of sustainablity. The passion of the staff and the owners are felt throughout the property. One of the most amazing things about the resort is that it is entirely self contained. The property contains its own zipline and canyon adventure, whitewater tubing, twenty miles of intermediate/advanced mountain biking terrain, natural springs with volcanic mud, and many, many miles of hiking trails. One can easily spend four full days here without ever feeling bored, and without ever needing to leave the hotel area. Magnificent all-around.